Annually, the Creighton University Dining team looks for ways to meet the needs of hungry students. One of Creighton Dining’s anti-hunger initiatives includes tasking students with assembling grocery bags, containing enough non-perishables for five meals, for college students facing hunger. Additionally, Creighton Dining has collected $295 in donations from students, which the dining team will match at the end of the month, to fund and fill the University’s food pantry, the Creighton Cupboard. Similar to the Creighton Cupboard, New Mexico State University (NMSU) operates the Aggie Cupboard, a free service for NMSU students and staff in need. This holiday season, New Mexico State University asks community members to donate reusable shopping bags filled with healthy and nutritious non-perishable items to feed those who are food insecure during the holiday season. Sodexo at the University of Tulsa is always active in the fight against hunger. Since the spring of 2018, the team has encouraged students to donate meals from their dining plans for food insecure students. To date, approximately 100 meals have been donated. Much like Sodexo at University of Tulsa, the University of Denver Dining team is addressing food insecurity on campus through its Swipe Out Hunger program, a nationwide initiative aimed at ending hunger on college campuses. The team collects meal plan donations from students and adds the donated plans to cards of students who have been identified by the University. The gifted plans are then ready to be used at the start of the new school year. The Greyhound Meal Exchange at Eastern New Mexico State University is another great example of the team’s partnership with the University. The program combines donated meals from student meal plans and monetary donations from faculty to support food insecure students on campus. With an $8 donation, the program can provide one meal to a student, anonymously. To date, the program has generated $3,040 in donations. George Mason University is also active in the fight against student hunger through initiatives including the dining team’s Thanksgiving Back event, where students packed 200 non-perishable lunches and donated $1 each to the student-run pantry, the Patriot Pantry. In 1996, Sodexo created Stop Hunger, an employee led effort to reduce food insecurity throughout the nation and in 1999, the Sodexo Stop Hunger Foundation was created to ensure that every child in the United States, especially those most at risk, grows up with dependable access to enough nutritious food to enable them to lead a healthy, productive life. 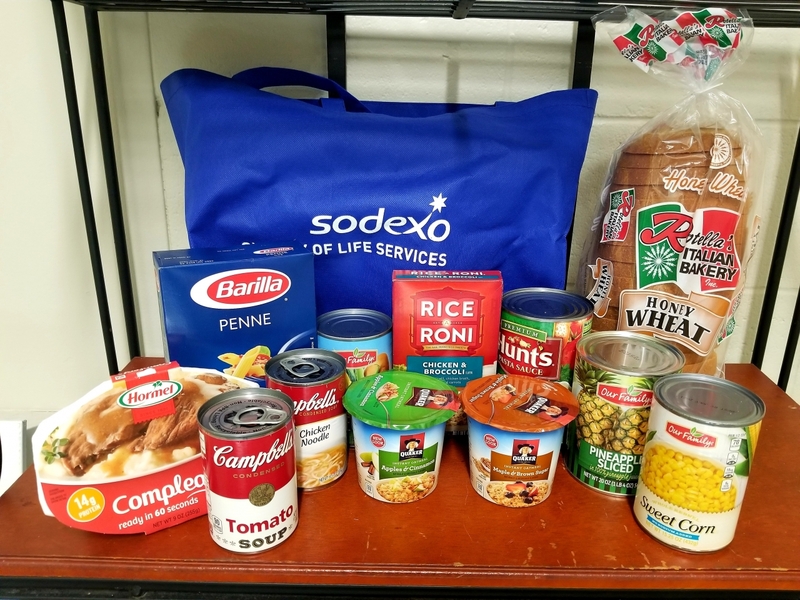 Sodexo’s work to fight hunger follows the entire student journey from primary to higher education, and as part of the organization’s promise to improve Quality of Life, Sodexo works closely with its university partners to make college students’ next meal the least of their worries. The Sodexo Stop Hunger Foundation works with and through partners to help end childhood hunger in the United States because no child should be hungry today or risk being hungry again tomorrow. Sodexo, Inc., which funds all administrative costs, and the nonprofit Sodexo Stop Hunger Foundation, mobilize experts, innovators, volunteers and donors to feed children; to advocate for policies to end childhood hunger; and to implement innovative potential solutions, particularly those designed by youth. In 2017, Sodexo contributed over 154,000 in volunteer hours and since 1996 has leveraged nearly $32 million in grant dollars to help end childhood hunger.